The plot thickens in this third chapter of The Button but it still feels like we're largely running in circles regarding some grand, epic reveal regarding the nature of Life, The Universe and Everything in the DC Rebirth Reality. Thankfully, there's some wonderful character material in Joshua Williamson's script. The best moment involves the touching interaction between the two Batmen, as father and son see the depth of their love for each other. The artwork by Jason Fabok and Brad Anderson looks amazing throughout. There's little in the way of action apart from a battle with the allied forces of Atlantis and Themyscira. 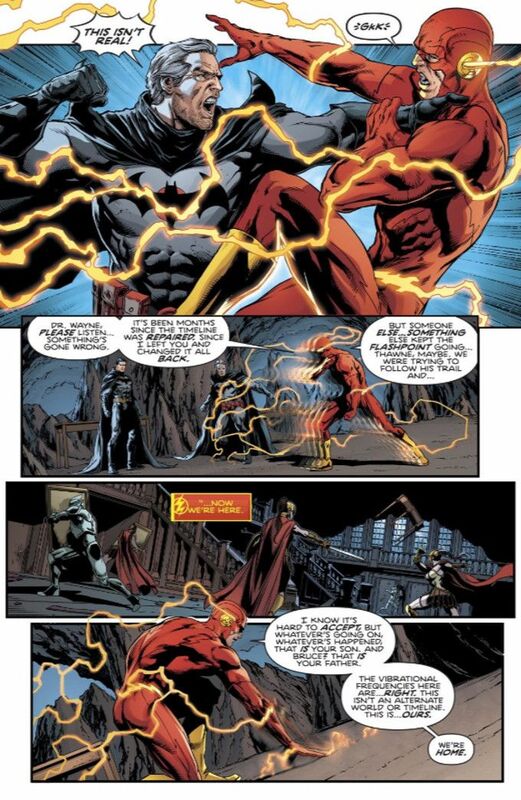 This fight seems to occur only because there needs to be -something- to add urgency to Barry and Bruce trying to leave Flashpoint apart from the universe falling apart but it's brilliantly depicted in spite of that. Final Analysis: 8 out of 10. Another solid issue, though most of the material in it is extraneous in terms of plot.